Yannick Pilon is a landscape architect specialized in golf course architecture that also offers full landscape architecture and graphic design services for golf courses. Based in Montreal, Quebec, Yannick Pilon holds a bachelor's degree in landscape architecture from the University of Montreal and works in the golf course and landscape architecture industry since 1997. Weather it is to plan a new course, renovate or redevelop an existing one, Yannick Pilon has the experience and the resources to prepare plans, illustrations and documents necessary to allow your project to happen on budget, and on schedule. Once your project is completed, Yannick Pilon also has the resources to help you promote it and make golfers appreciate it even more, all while offering the opportunity to generate revenues for your club and help reduce costs on your course maintenance budgets. I look forward to hearing your comments and providing you with more details on my many services. Hoping to serve you shortly! Yannick Pilon Golf is now partnering with the firm Agence RELIEF DESIGN, a landscape architecture firm based in Montreal. Together, our two firms can cover all your landscaping needs, whether it is for golf courses, or their associated amenities. 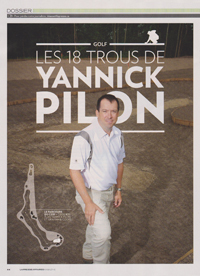 Yannick Pilon Golf was the object of a four page article in the magazine "La Presse Affaires", inserted in Montreal's "La Presse" newspaper. Clic here to read the article.